High-performance concrete demolition hammer featuring low vibration and brushless motor for longer life, suitable for working on walls and floors. 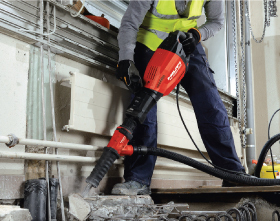 The second generation Hilti TE 1000-AVR breaks through tough concrete and boasts a remarkable 50% demolition power increase. Featuring Hilti’s HiDrive technology and delivering the highest output per day, it’s packed with all the power you need for tough demolition work with the lowest, unmatched vibration, thanks to AVR (Active Vibration Reduction). 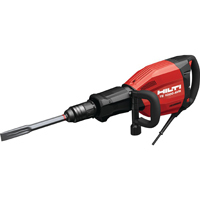 energy and innovative Hilti Polygon chisel design. sub-chassis Active Vibration Reduction (AVR) system. lubrication systems for longer service intervals and tool lifetime.